Apprenticeships can be hugely beneficial for your career, allowing you to earn and learn on the job. If you’ve reached the apprentice interview stage, well done! – you’ve already beaten dozens of other candidates, and now it’s time to show an employer why you deserve pride of place in their apprenticeship programme. First impressions count, so dress smartly and arrive 15 minutes early to show you’re serious about the opportunity. Iron your shirt, polish your shoes and remove that glittery nail polish you wore at the weekend. Nobody is impressed by dirty fingernails or messy clothes. Research, or lack thereof, has the potential to make or break an interview. Read up on the company and job role, and practice interview questions with a parent or teacher, so that when those challenging questions come your way, you’ll be prepared. It’s highly unlikely you’ll get past an initial interview if you come across as sluggish, uninspired, or only in it for the money. Show your enthusiasm and find a way to express what’s drawing you to a certain line of work – remember, the interviewer was sat in your position once too! Speak up, but take a measured approach when answering questions to ensure you appear articulate. You won’t be judged for asking to have a minute to consider your answer, so take your time and think before you speak. School grades are important, yes, as is the way you’ve structured your CV. Yet to stand out from other candidates, it’s vital to demonstrate transferable skills and experience. So if you’ve had a summer job, Prefect position or completed your Duke of Edinburgh, shout about it! Interviews are like a two-way mirror. Asking questions about what responsibilities you’ll be given, and what long-term opportunities there are in the company is guaranteed to make you seem curious, which is the hallmark of a worthwhile apprentice. A post-interview email is like an extra digital handshake, but so much more. Thank the interviewers for their time and subtly reinforce how excited you are to hear back, to leave a lasting impression that can only work in your favour! 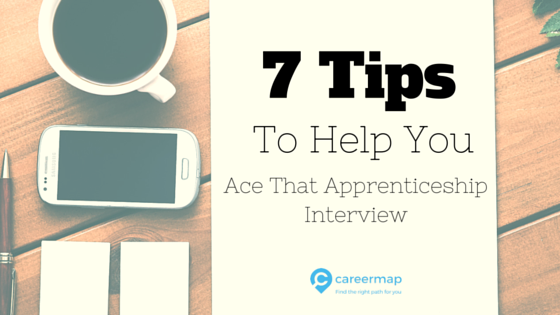 So, there we have it – the essential factors of a great apprenticeship interview. Use these points as launch pads for your own inspiration, never losing that honesty that got you to this point in the first place, and you’re bound to impress potential employers. Still looking for that apprenticeship opportunity? Check out www.careermap.co.uk/job-search gives you access to training programmes in an exciting range of industries across the UK. Start your job search today to discover the perfect apprenticeship for you.